Lily Parker is new to St. Sophia's School for Girls, but she's already learned that magic can be your best friend . . . or your worst enemy. They say absolute power corrupts absolutely. Turns out that even a little magic can turn you to the dark side. That's why Lily has to learn how to control her newly discovered paranormal abilities, on top of avoiding the snobs who think they run her school, nursing a crush on a cute sophomore wth a big werewolf-y secret, and fighting the good fight with her best friend, Scout, as they take on Chicago's nastiest nightlife - including the tainted magic users known as Reapers. Then one night Lily and her friends are attacked by creatures like nothing they've ever seen before. And in the aftermath, she realizes that she'll have to use her growing powers sooner than she thought - because she's smack in the middle of a paranormal turf war that could tear Chicago apart . . .
Lily and Scout are back in this amazing second installment in the Dark Elite series. Lily has been through a lot since her parents sent her to St. Sophia's, and it hasn't been the easiest transition from "normal" girl to firespell user. And it's just her luck that, once she is accepted into Enclave Three, strange, slimy things begin to show up in the catacombs beneath the school. As the Enclave investigates, they realize that this new phenomenon may be a part of a larger, much scarier scheme - and if they don't tread carefully, they could end up as lunch for some of Chicago's scarier creatures. I have waited far too long for this sequel to arrive! Firespell completely blew me away, as it was my first Chloe Neill reading experience and I had no idea what to expect. Lily, Scout, Jason, Michael, and even the more important secondary characters are all well fleshed-out, and their personalities jump off the page. 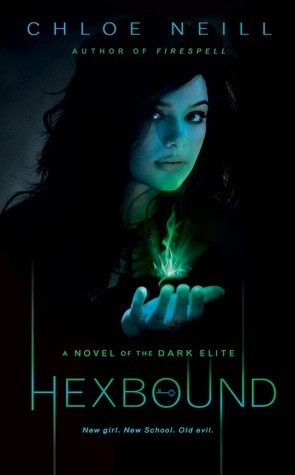 And though I do wish that some aspects of the story had been expounded on, such as Sebastian's role and Lily's parents' job in Germany, Hexbound stands well on its own and sets up the plot for the third book. Thankfully, we won't have to wait as long for Dark Elite #3 as we did for Hexbound - it will be out in July!